It was a dismal, rainy June day when my summer interns started. 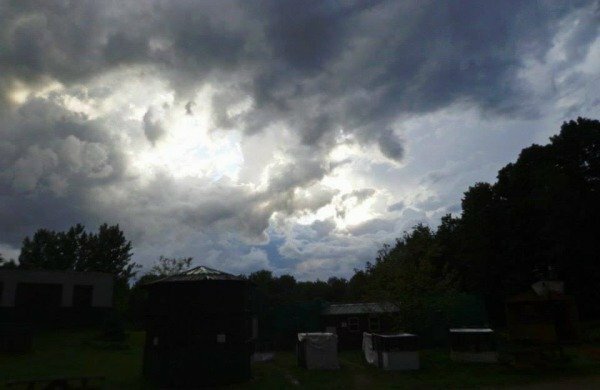 The previous three nights severe thunderstorms had pounded the region. The phone rang early. It was the Marathon County Sheriff’s Department, calling to report a Bald Eagle standing “crumpled” in remote area near Wausau, Wisconsin. It was Megan’s first day as an intern for REGI. I grabbed a blanket, sheet and a net. “We are off to rescue a Bald Eagle, kiddo!” I said, and off we went. It was pouring rain as we drove to the site. We had a hard time finding her, as her soaking wet feathers blended into the foggy landscape. Her posture was not regal. She was stooped over, eyes closed. I slowly walked toward her. She opened her eyes but didn’t move. I put a blanket over her shoulders, as if she were an injured, elderly person, and carried her back to the truck. The eagle was so hypothermic I was reluctant to put her in a transport box. Instead, I put heated pads under her wings and held her as Megan drove back to REGI. We put her on the clinic’s exam table. Even as a veteran wildlife rehabilitator, I could scarcely believe the sight before me. An area on her abdomen the size and shape of a pie pan was open. Not only were her organs exposed, the entire area was alive with maggots. We all thought the kindest approach would be to end her suffering, but then…she raised her head and looked directly at me. She chirped a quiet but definite message, and everyone in the room understood she was not done with life yet. We worked in shifts, tube feeding her, giving her supportive therapy, and removing maggots. In mammals, maggots eat only dead tissue and are occasionally used to debride wounds. But in birds they eat living tissue, and once they are internal will kill the patient. We have treated thousands of wild patients, including eagles, but this one was so extraordinary we began to call her “The Special One.” She would watch us intently, as if she were grading us on maggot removal and patient care. Alternately she would sleep, then awaken and chirp as if to urge us on and let us know she was still alive and willing. We medicated her for maggots, picked at least 100,000 of the creepy critters from her abdomen, and finally treated the injury. Twenty hours after she was admitted we were finally able to put her into a cozy enclosure, and get some sleep ourselves. The following morning I was greeted with a gentle chirp when I opened the clinic door. I opened the hospital box and she looked at me with a steady gaze, her head erect. She was bedraggled but compared to the day before, she looked miraculous. A man called, identified himself as the owner of the property where she was found, and wanted to know how his eagle was doing. “Most people don’t survive being hit by lighting,” he said. “I was sure my eagle was a goner.” Until then, we’d had no idea what might have caused her injury. The man said the eagle had nested on his property for several years. The previous evening he had seen her white head above her nest as he drove by, and late that night he’d heard a nearby lightning strike. The following morning he found the eagle’s tree all but gone – hit by lightning, split down the middle, and burned, as there were bits of charred wood on the ground. He could find no sign of the nest, the chicks, or either parent. Lightning is an electrical charge similar to one from a faulty wire. If there is an entrance wound, there is an exit wound. We had to find it. I gingerly took her in my arms and once again put her on the exam table. This time she was stronger, so I could do a more complete physical. Her abdominal wound looked good … or as good as a horrific wound could look. Her wings were perfect. But when I turned her on her side to examine her back, we found the exit wound – alive with maggots, at the top of her tail area. We had come so far. The eagle chirped again, this time with more strength and determination. If she was willing, we would not fail her. Luckily, this wound was not as severe. Within a few hours we had cleaned it, picked it clean of maggots, and treated it for any residual maggots or their eggs. Days turned into months as both wounds healed perfectly. She was indeed “The Special One.” Never once was she aggressive; she was cooperative to the point of being eerie. When her wounds healed completely, we put her into an outdoor exercise flight to begin her reconditioning for release. It took time to redevelop her flight muscles, which are located in a bird’s chest and abdomen. Before she left our care she had to be 100% ready to face the wild world again. As if her life had not been amazing enough, there was one more twist. In early July, a young bald eagle fledged into the Wisconsin River. He nearly drowned. A State of WI Department of Natural Resources Warden rescued him and brought him to REGI. As soon as he was ready, we put him into the conditioning flight with eagles of all age groups, including “The Special One.” The little guy was nervous and whined pitifully as I put him in the flight. I knew he would be fine, but he was not convinced. The next morning, the youngster and “The Special One” were sitting next to each other. She was preening his back. He was no longer whining. They were often together from then on, exercising and interacting with the other recovering eagles. 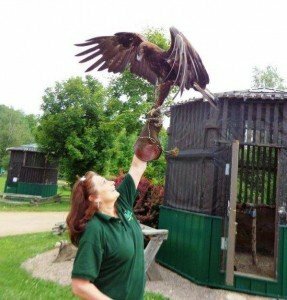 Wisconsin eagles are often released in January or February, when they are not territorial. On the third Saturday of January in Sauk City, WI, our special eagle was released to reclaim her life. She and the others were banded with a USFWS band, so we would know if they were ever ever found again. She was found again, but it was a sad time. Six years after her horrific injury and survival she was found ¼ mile from the lightning strike, but this time she had been hit by a car and killed. She had not only survived being hit by lightning, 150,000 maggots (a light estimate), an infection in her peritoneum and pneumonia, but she had recovered, was released, and went home. It is likely she bred again for several years before her end. 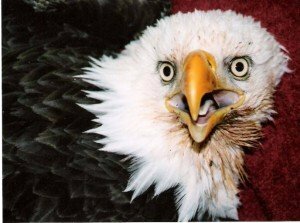 So eagles can indeed survive being struck by lightning. Marge has been nominated for a $40,000 award – one which would make a huge difference to REGI. Once you watch this video, you’ll want to vote for her every day. And you can! What an incredible story! I am voting for her! Thanks, Wendy! She’s a miraculous woman. Before my bird rehabber book came out I asked her if there was any way she could read it and tell me if I’d written anything stupid. Despite her insane work load, she read it and gave me great feedback. Please pass her eagle story along!